I cannot believe our little Rex is already one month old. And I can tell he’s grown quite a bit since birth…which is a good thing because he’s going to need all the strength he can get with a big sister like Todd-Zilla – I mean, Landri. I think Scott said it best when he summed it up with the statement, “Get tough or die, little man” (and I really need to make this into a onesie for Rex). Landri continues to struggle with the concept of what it means to be gentle. I think she’s doing a little better “handling” Rex these last few weeks, but Scott says he’s seen her purposefully hit him, so clearly I’m missing something sometimes. Regardless, I believe that she’s already training him to have a higher than normal pain tolerance (for a male at least), LOL! Being the second kid, Rex has had some new firsts pretty quick and I imagine his whole life will be like this. Within days of birth, he had been to Target, Babies R Us, HEB many times, two high school girls soccer games, a bar (eek! ), multiple restaurants for dinner and lunch, Scott’s family’s ranch, camping, and in the first month over 45 miles in the stroller on walks. He even already had his first cold and “fever” thanks to Landri. Turns out that fever for newborns is 100.4 or higher (which requires an ER trip) and his was only 99.7. Regardless, he has had some serious nose boogers already and is hopefully on his way to building his little immune system. Rex is a cool little baby! I forgot how awesome newborns are and how exciting everything is because it’s all new for them. Okay, so Rex’s favorite things…hands down, number one, I would say eating. But after that, it would be bath time. He can be screaming at level 3000 and as soon as you ease his naked little body into that warm bath, he immediately silences and becomes very zen-like (yes, I’m certain Scott doesn’t like the words zen and Rex used together in a sentence, haha). Rex also loves what Scott and I dubbed as “baby crack” with Landri: gas drops and gripe water. They are diaper bag musts. Another thing he really likes is being held and especially sleeping in bed with us. We are still working on eliminating that and are making progress slowly but surely. It’s 3am right now and Rex is actually in his own bed! And lastly but not least, Rex loves the Baby Einstein activity mat. It’s crazy how babies like that thing so much – Landri did too! Rex also has things that he hates, and they are pretty typical as far as baby dislikes go. Number one, hands down, he hates being hungry. And this boy can eat. He eats way more (volume) than Landri ever did at this age, and way more often. He can’t even make it through the night yet without waking up several times to eat (Landri had already started sleeping through the night at this age). He hates wet and dirty diapers, and hates being harassed by Todd-Zilla (yes, she seriously makes him cry at least several times per day). He also isn’t a huge fan of the swing…which is fine because it’s an item within reach of the dangerous Todd-Zilla and is unsafe for him to be in because of that! As far as skills go, as I mentioned earlier, Rex has serious eating skills. He also seems very strong to me – he bears weight on his legs, holds his head up fairly well on his own, and knows how to grab onto things (fingers, hair, whatever comes his way). He has blessed me with some smiles and they are becoming more frequent although are still accidental. 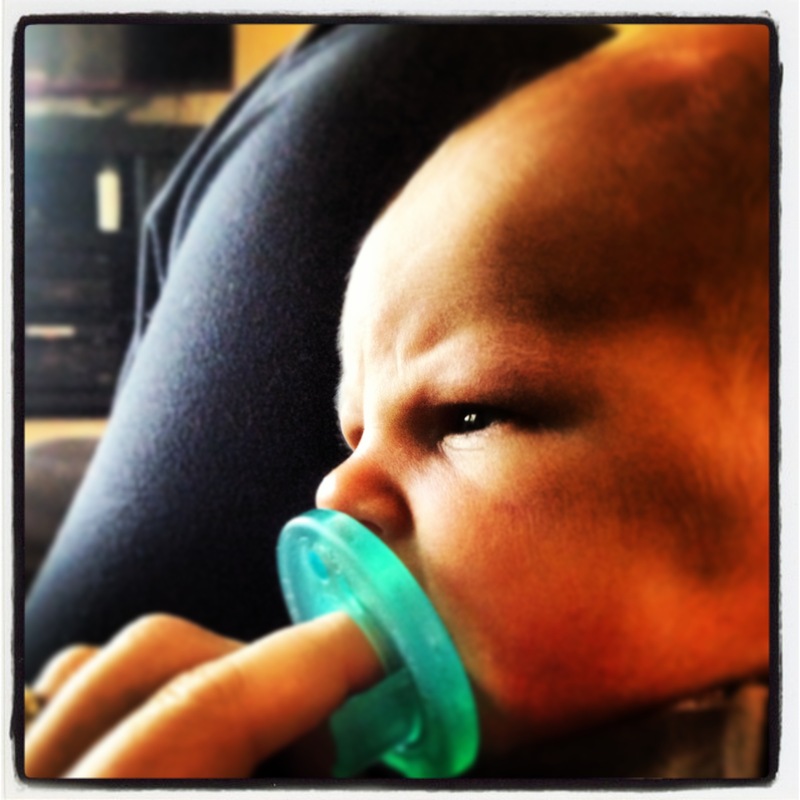 He also makes some funny faces and furrows his brow a lot just like Scotty. For the record, I disagree with all the people who think boy diapers “are so much easier” than girl diapers. Boys have only slightly less nooks and crannies for poop to hide, and there are other complications as well, mainly being that they are equipped with a potential “sprinkler hose” that might turn on at any moment. Yes, I’ve been sprayed in the face and chest countless times despite using those handy dandy little pee-pee tee-pee’s! It’s actually pretty amazing how far he can spray pee (probably up to four feet in distance I would say). And while we are on the topic of diapers, I will share that like Landri, Rex is an impressive little pooper. He may be small, but he is mighty. He can blow it out like the big girls and boys. You will be changing him and all of a sudden it comes loudly exploding out of him like a projectile missile headed towards the former USSR. Just like his pee, it literally shoots feet in distance and you gotta have catlike reflexes to not get taken out! Considering that I’ve been hit by both (pee and poop) many, many times already, I clearly need to work on my reflexes! M: What is most surprising about Rex? S: Nothing. Nothing is surprising. He’s grown a lot in a month. M: What is Rex’s most interesting feature? S: He doesn’t have an interesting feature. M: Well, I think he has the most perfect head shape. S: That’s not interesting to me. M: What would you say are some of Rex’s best skills? S: He’s a month old. He doesn’t have any skills. Crying, bed wetting, eating, that’s about it. M: What is Rex’s favorite thing in the world? S: I don’t know if I have one <laughing as Rex screams bloody murder>. First real sporting event – HS girls soccer playoffs! Previous Post 19 months: Toddler Fashion, Bad Habits & More! Next Post First Post-Rex Run!